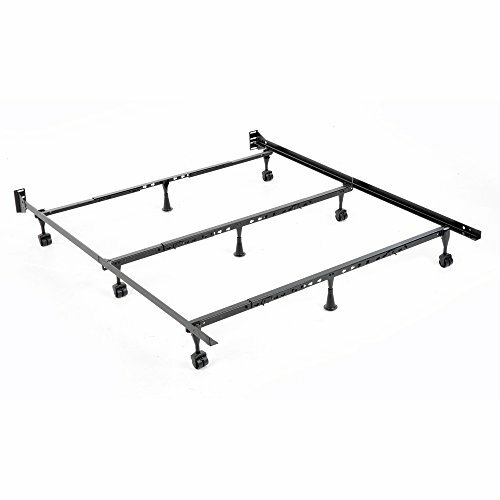 Solutions is a universal folding bed frame that provides all the support of a standard steel frame, but comes with the benefit of quick and easy, tool-free adjustability from Twin through California King sizes, while still coming in a compact package. Built with sturdy construction and a black powder coated finish, Solutions has folding side rails to keep this versatile “one frame fits all” compact and portable. The angle-steel side rails measure 1.5” x 1.5” x 70” with a 7.5” height from the floor. The legs are deeply recessed for safety and come with (6) locking rug rollers and (3) glides attachments. Rug rollers will provide mobility and their 2.25” size allows for variable bed heights. The Keyslot Crossarms features a Posi.Lock to hold the (3) sets of 1.25” x 1.25” angle cross supports in place. Heavy duty oversized headboard brackets are fixed to the folding side rails to provide sturdy connection to any Twin, Full, Queen, King or California King sized bed or headboard. The easy-to-ship Solutions bed frame carton measures 38.75-inches (L) by 12-inches (W) by 5.5-inches (H) and includes everything needed for tool-free assembly. With a wide array of dependable options, Fashion Bed Group offers peace of mind and a solution for any bedding support need. Our products exceed all industry standards and can help preserve your mattress warranty. The Solutions Universal Folding Bed Frame comes with a 1-year limited warranty against manufacturing defects. The Fashion Bed Group, a division of globally diversified Leggett & Platt Inc., is an industry leader in the production of fashionable beds, adjustable bed bases, top of bed textiles, bedding support and barstools. By keeping a close eye on the design community and other fashion and decorating sources, Fashion Bed Group stays on top of the trends and knows the right mix of finishes and innovative designs to continually provide quality crafted products at an exceptional value. If you have any questions about this product by Fashion Bed Group, contact us by completing and submitting the form below. If you are looking for a specif part number, please include it with your message.